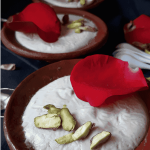 Phrini is also spelt as Firni and is Rice Flour Pudding is an Indian Dessert generally made from milk but I have used plant-based milk and made this Vegan Phirni for Holi Festival. Since Phirni is soy free, gluten free, oil free dessert with little sugar you can occasionally have it if you are following Pegan Diet. Phirni|Firni is so light and yummy it can be consumed by Senior Citizens too. 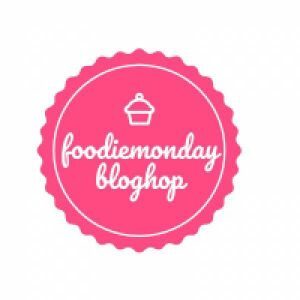 For FoodieMondayBlogHop today we are doing #186 PlantBasedMilkRecipes. I never did think I could get such a delicious phirni something I have failed making every time I tried it. Holi is the festival of Colours and we celebrate the onset of spring, the victory of good over evil. Young and old celebrate Holi by lighting bonfires, by smearing colours called gulal and play with water. It is a fun-filled day when friends and family get together where sweets are eaten. People also dance to traditional music. Like any other Indian festival, Holi is celebrated with some dishes that are specific to the festival. Holgi, puran poli, obbattu a traditional Indian flatbread that is stuffed with sweet Bengal gram stuffing. Katin Saar or the Savoury soup from the liquid after boiling the Bengal gram. Thandai or Sadai a delicious milkshake that is made by blending of nuts and spices. Bael ka Sharbat is a refreshing and healthy Summery drink. Shikanji or lemonade traditionally a summer thirst quencher in Northern India. Shahi Shikanji that is served chilled. Pankam a lemonade again for the hot Southern Indian Summers. Nevri, Karanji, Ghujiya a deep-fried Ravioli that can be made sweet or savoury. So this Holi let us celebrate with Vegan Phirni made from homemade almond milk that melts in the mouth! Phirni is made from rice flour or ground rice whereas rice kheer is made from rice the rest of the ingredients like milk, sugar etc. are the same. Both are flavoured with cardamom and/or saffron, garnished with nuts. The difference between kheer and phirni is the texture phirni is smooth creamy pudding-like, unlike the rice kheer. Serve Firni as a party dessert garnished with slivers of almonds, pistachios or for breakfast with pumpkin seeds, sunflower seeds, and chia seeds. 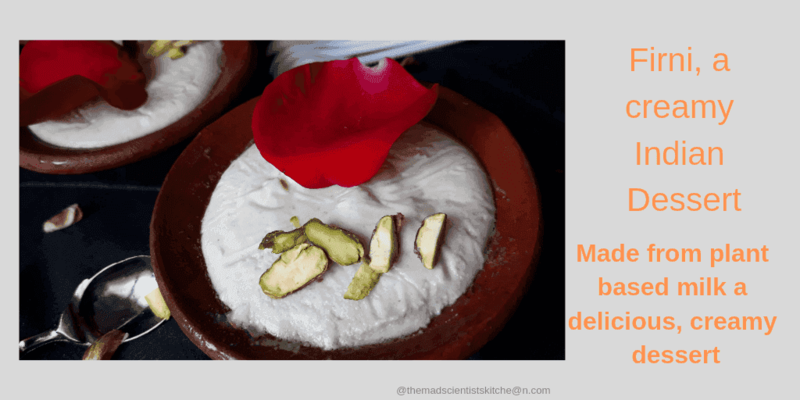 A vegan dessert made from plant-based almond milk and rice flour for Holi, the festival of colours! Wash and soak the almonds in sufficient water overnight. In the morning transfer the nuts to the mixer/blender and add cup water. Blend add water as needed and blend to a smooth mixture. I neede about cups water. Strain in a cheese cloth/ fine sieve and use the stariined liquid. In a thick bottomed kadhai/wok add the rice flour, sugar and the milk. Blend using a whisk till there are no lumps. Add the rest of the milk, salt and mix well. Check for sweetness add more sugar if needed. Now place on the gas and head on low flame. Stir occasionally. Once the mixture starts boiling use the whisk and stir constantly. This prevents forming of lumps which you have to otherwise work on blending in the pudding. Once the smooth mixture starts coating the back of the spoon it is done. Transfer to the small phirni pots or bowls. Let the mixture cool to warm and you can serve it garnished with nuts, chia seeds for breakfast or as a snack. But I chilled it and garnished with sliced pistachios, saffron or dried rose petals. 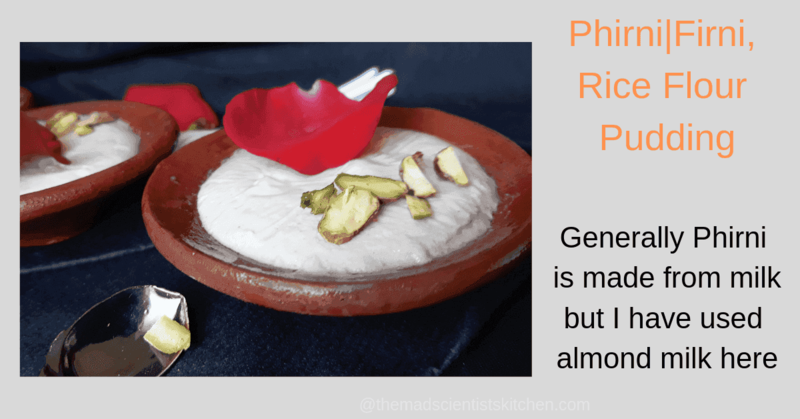 You can use regular milk to make phirni too. Just replace the almond milk with milk. I generally use 6% fat milk. 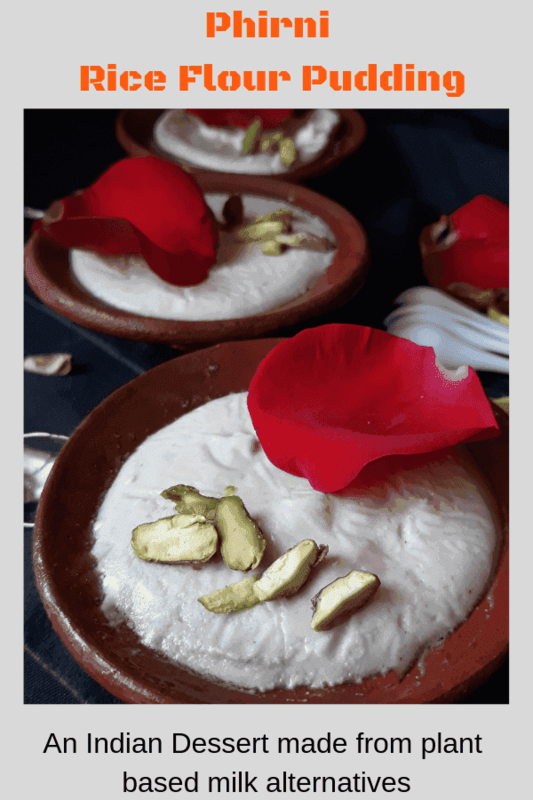 As soon as I saw the picture of the phirni…I said wah, wah. I’m partial to phirnis and love your version with almond milk. Love how you’ve made it in clay containers. Absolutely delectable dessert and would be loved for holi. The addition of almond milk here makes it more nutty in flavours when cooked with rice. Tastes so good when chilled, especially during summers. Thanks, Vidya. That is really a delicious phirni. Holi or otherwise, I love Phirni ! and love that you have presented us in that earthernware. The rose petals reminds me of Vaishali, for some reason :p .. Along with a well made Rasmalai, this is one dish I dont miss to indulge at weddings / buffets ! I was to post Rasmalai too. That still is in my to write list. Yes, even I thought of Vaishali when I used the rose petal. Firni looks devine Archana. I can imagine the heavenly taste. Rose Patel on the top looks so beautiful. Lovely share. I make Kesar phirni on festivals , making it with plant based milk is a brilliant idea ! Your post tempts me to try it soon. Loved this plant based phirni, I make phirni but always used milk. Good for the vegans. Wow the phirni looks so creamy. Addition of almond milk increases it’s nutritional content. Yummy. The Phirini looks so smooth and creamy.. Love the addition of Almond milk. the rose petal on the Phirini is making it so inviting.. superb recipe. This is a great dairy-free phirni version! Love that you presented it in the traditional way by using earthen bowls, it looks amazing! I love this vegan version of phirni. Love the way you have presented it. This phirni looks divine Arch. The rose petals, the almond milk , everything about this is so so good. This Vegan Phirni looks so tempting. Addition of almond milk adds a nice taste and richness to this yummy dessert. Fab share Archana.